“Sold out'” said the sign at the ticket office when I eventually made it to Frieze this year. Frieze Art Fair is the most important UK international art fair of the year. It takes place every October in Regent’s Park where the art world glitterati gather over copious glasses of champagne and talk each other into buying outrageously expensive works of art. In conjunction with the fair there are a million and one other events staged throughout London. Galleries host private views, collectors host parties, people championing causes host silent art auctions and Christie’s and Sotheby’s contemporary art sales keep the art market buoyant with dazzling prices and juicy gossip. I was looking forward to it. What could be more entertaining than an afternoon of glamour, bubbly, crazy contemporary art and crazy contemporary people? If I hadn’t been so lazy about buying a ticket beforehand I wouldn’t have missed it but then again, I wouldn’t have gone to the most thought provoking exhibition of the entire week. It was 4.30 pm. With no chance of getting into Frieze I hopped on the Bakerloo line to Charing Cross and legged it across Trafalgar Square where, tucked away in the relatively calm surroundings of the ICA was the exhibition “M16“. I had about about an hour before it closed. 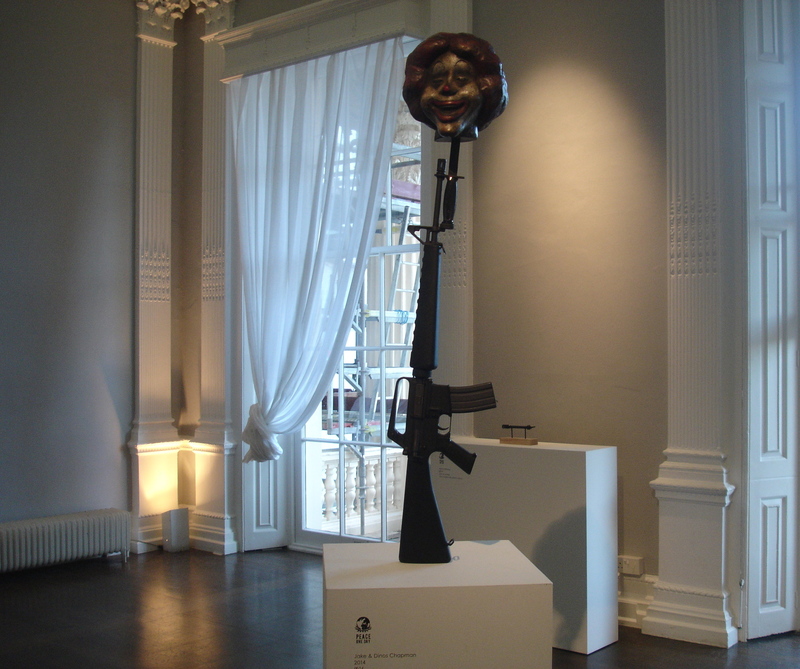 Curated by Jake Chapman “M16” was organised to raise awareness of Peace One Day, a non-profit organisation founded by actor turned film maker Jeremy Gilley who basically created the first internationally recognised day of cease fire and non violence. His is an incredibly inspiring story. During a period of soul searching in the summer of 1998 Gilley realised that an official day of world peace didn’t exist (there was one actually – every 3rd Tuesday of September – but nobody knew about it and those who did know ignored it) so he decided to create one himself and make a film about his endeavour. A tad idealistic you may think, but three years later, on the 7th September 2001, at the United Nations General Assembly Kofi Annan announced the 21st September as the fixed date for Peace Day: the official day of cease fire and non violence. By the 21st September 2012 over 470 million people in 198 different countries were aware of Peace Day. The aim is to reach 3 billion by 2016. Gilley’s film The Day After Peace documents his story from the initial idea to Peace Day being honoured by life saving initiatives taking place on the 21st September annually across the globe. For example, on the 21st September 2007 a cease fire in southern and eastern Afghanistan allowed 10,000 vaccinators to enter these usually inaccessible areas without being harmed or taken hostage and vaccinate 1.4 million children against polio. More recently the Howard G. Buffett Foundation has teamed up with Gilley to establish a peace campaign including humanitarian aid in the Democratic Republic of Congo (DRC) and the Great Lakes region of Africa. From a madcap idea to millions of lives being saved and millions more seeing the benefits of literally just one day of peace per year. The entire documentary can be viewed on youtube or by clicking here. It’s the most uplifting documentary I’ve ever seen. 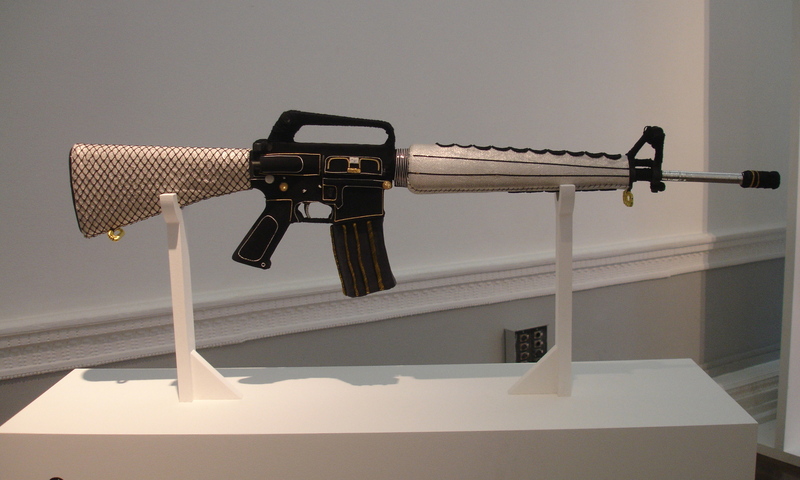 For “M16” fifteen famous artists were asked to transform decommissioned (which means they’ve been used) M16 assault rifles into works of art. 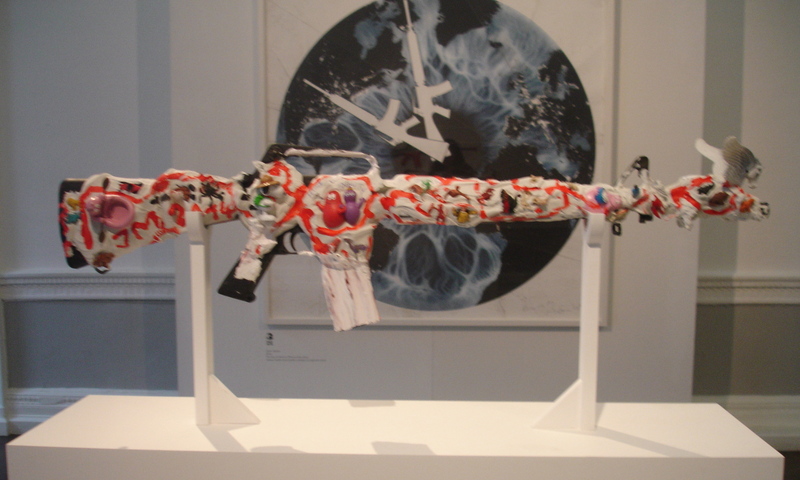 Artists include Peter Doig (his painting The Heart of the Sun sold for £4,562,500 at Christies’ art sale two days earlier), Mark Quinn (“Thaw of the Kokolik River” sold for £122,500 in the same sale) and Sam Taylor-Johnson who, rather than recrafting a rifle, framed an article from the Ham and High newspaper about how her house in Primrose Hill was raided by armed police having been alerted by passers-by who had seen, through her studio window, the rifle on the table. 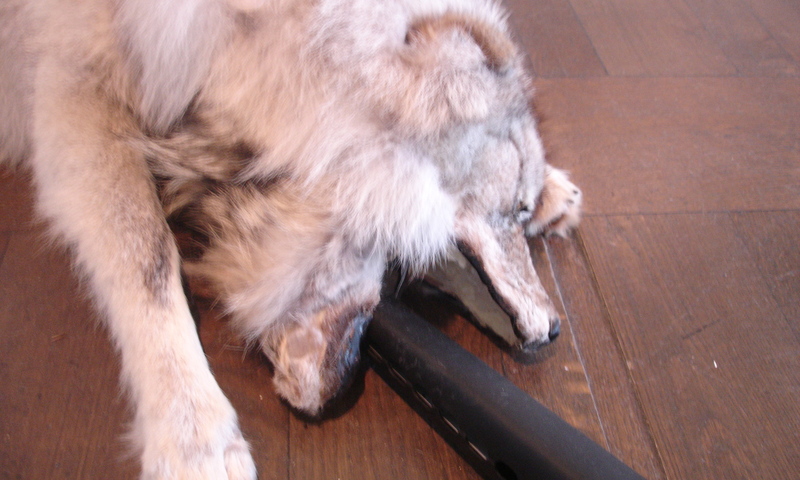 There’s also a rifle signed by Kate Moss. 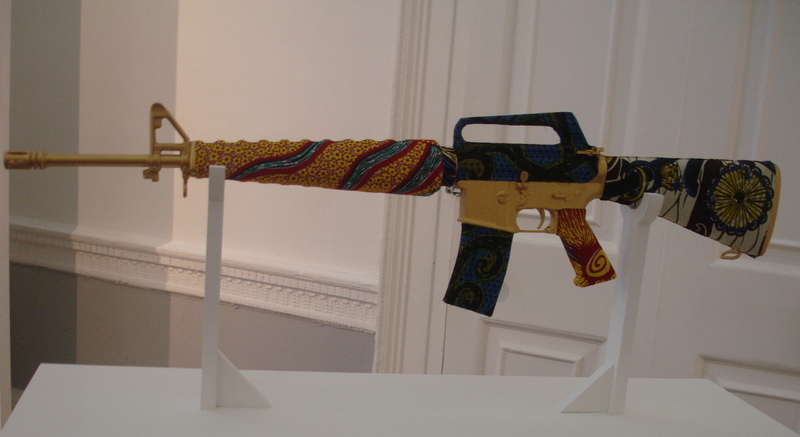 The ‘AKA Peace’ rifles made nearly £500,000 at auction in 2012. 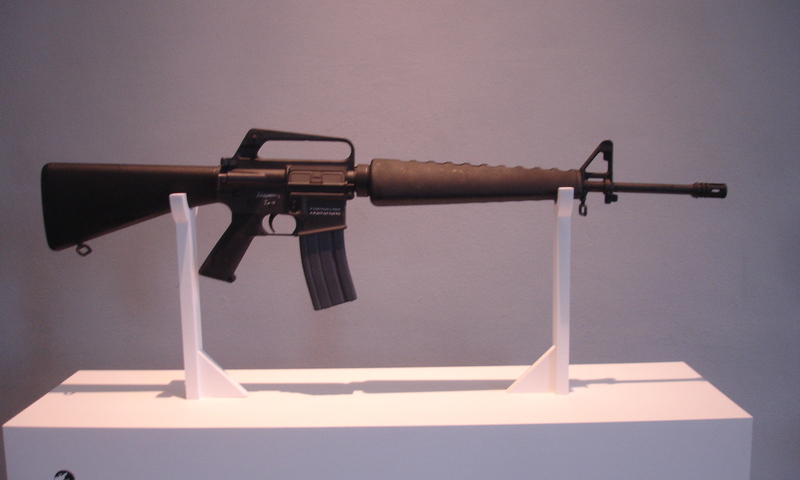 I believe the M16s will be auctioned at Bonhams on the 28th January 2015. I hope the auction goes well although pulling off the same(ish) good thing twice rarely reaps the same rewards which is a pity in this instance.